Robert Humm & Co specialises in rare and out-of-print books about railways, other transport and industrial history. 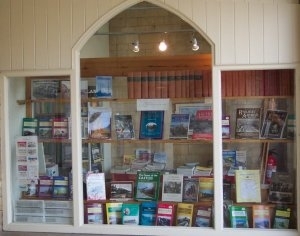 We also stock a wide selection of new books on railways. For over a quarter of a century our shop was in the former station master's house at Stamford railway station but we have moved to new premises in Stamford and the shop at the station is closed. We opened at 59 Scotgate, Stamford PE9 2YQ on 15 February 2016. The new premises are no great distance from Station House and remain convenient for the A1 Great North Road and the railway. Stamford station, with an hourly service on the cross-country Birmingham to East Anglia railway, is ten minutes walk. Stamford itself is a handsome town with fine architecture, excellent shopping and restaurants - it is well worth a day out in its own right. We offer, as always, a mail order service and welcome enquiries by phone, post or e-mail. Our knowledgeable and helpful staff are always happy to help. Good News! We have a new parcels contract and our UK mainland postage rates are now significantly lower. In addition to the excellent shop stock we issue printed catalogues of our choicest rare and out-of-print books once or twice a year. The contents of the catalogues are not listed on this web site - they have to be ordered directly from the shop. You will have gathered that this is not primarily an on-line business. However most of our new books and a little selection of our second-hand stock are listed on this site; most of the listings can be ordered on-line. 1. If you have been whizzed back to the Home page while placing an order you'll need to find your way back to the Checkout. To do this use the Checkout link at the top left of this page. 2. To remove an item from your order (or to alter the quantity of any item) you have to leave the Checkout pages. At the top of all the other pages is a link to the View Order page : here you can alter your order. Remember to click Update and Save when it is correct. The View Order page has is a link back to the Checkout. British Military Railways Overseas In The Great War. Railway signal engineer of Worcester. Very large, 256 pages, photo illustrations (some coloured), diagrams and drawings from contemporary sources, glazed boards. **Dutton was employed in the signalling industry for thirty years before he founded his own company - Dutton & Co - in the wake of the Armagh disaster to provide the interlocking systems required by new safety legislation. He worked in Britain, Ireland and overseas; much of his work is still extant on preserved railways, in museums and a little is still in use on the national railway system. Very readable account of the man and his many achievements. + Red For Danger. A history of railway accidents and railway safety. D&C, 1982, 4th edition, revised and augmented. Octavo, 307 pages + 12 pages plates of railway accidents, previous owner's name on endpaper, slight wear to jacket and fading on spine, otherwise VG. **Survey of major accidents in Britain, classified by cause.